2) Vocational school of mechanics, electronics, telecommunication and transport “Hristo Botev” – Shumen, Bulgaria. The social competence as a general concept, consist of social, emotional, cognitive and behavioral skills. It is regarded as a basic quality of effectiveness at social interactions associated with successful behavioral patterns. Social competence is related with variation in the ability to react in different situation, learn from past experiences, and apply the past experience to the changes in social interactions. The present writing is aimed to define the relation between the level of forming a social competence and aggressive behavior at school of 18-years-old students. The relation social competence and aggressive behavior is analysed by the Giessen Test (GT). The methodology is suitable for studying crucial social qualities and reacts. The subjects of the research were two groups of students - a group of students with aggressive behavior and a referential group. The data lead to conclusion that the analysed students who had performed aggressive acts at school do not have considerable deviations of the average values according to the scales of the GT. Their behavior is a result of not well formed aggressive impulse and lacks of mature self-assessment. Key words: social competence, aggressive behavior, Giessen Test, social interaction. Please cite this article as: Boncheva I, Tomcheva St. Social competence in 18-years-old students who had performed an aggressive act at school. J of IMAB. 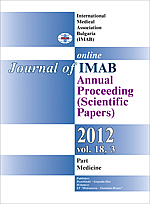 2012; 18(3):323-326. doi: 10.5272/jimab.2012183.323. 2. Semrud-Clikeman M. Social competence in children. New York, Springer Science – Bussines Media, 2007. 4. Reschly DJ, Gresham FM. Current neuropsychological diagnosis of learning problems: A leap of falth. In: Reynolds CR. Child neuropsychology: techniques of diagnosis and treatment, New York, Plenum, 1989, pp. 503-519. 7. Gresham FM. Social Skills Instruction for Exceptional Children Theory into Practice. In: Exceptional Children in the School, 1982, 21(2):pp. 120-135. 10. Krokinskaya OK, Possel YA. Social subconscious: sociological and psychosociological aspects. Piter, 2005 [in Russian].